Your bedroom may look smaller than it actually is but it’s usually the fault of the furniture which is placed into it that makes it appear so small. When designing a bedroom, it’s vital to take measurements and to choose those inspiring ideas that make the small bedroom look larger. Think of the things you need within the bedroom space. If you are, for example, using your bedroom space incorrectly, then perhaps you need to get back to basics. Color is everything. Light colored walls and ceiling in a mat finish give you a better feel for the space. Natural light should also be maximized by using minimal window dressing. Blinds are ideal or curtains in linens which are white, as these allow light to get into the room. Painted floors can give a room depth so if you have old floorboards, why not paint these too. If you have nice floorboards, these can be sanded down and varnished in a light color to give more warmth to the room without taking away the illusion of space. You would be surprised just how much visual space this creates. Other possibilities for bedroom floors include stencils on a plain painted floor as these add an element of design to a room without making it too busy. If you do opt to do this, be sure that the design shows all around the room and is not obscured by rugs. Worried about lack of color? Don’t be. The color comes in the bed linen you choose and that comes later. First, you need to find a bed which also acts as a place for storage. If the bed fits into an alcove, why not use the area above the bed to create cupboards? This frees up floor space. If there is no room above the bed, what about beneath it? Beds which have storage drawers are perfect, though be careful of size. Instead of buying a Queen sized bed, go down a size, as this is still a good size and will free up floor space as well. 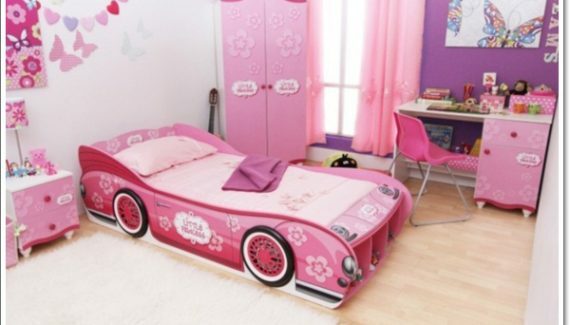 Look also at the design of the bed. 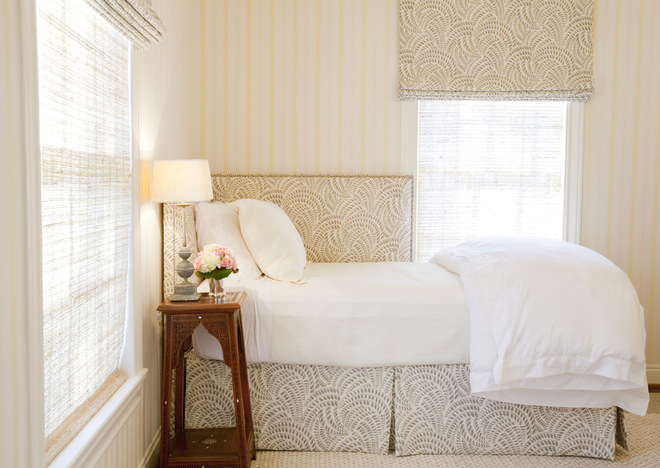 Big bedheads make the room look crowded so avoid them, opting for smaller ones or beds with no bedhead at all. The lower the bed, the more effective the creation of the illusion of space will be. Those beds which take up the same space can look entirely different because of bulk. Avoid bulk at all costs as the bedroom is small enough already without adding more. Add shelves for bedside bits and pieces instead of having separate items of furniture. Instead of trying to squeeze a chair into cramped space, use a floor standing clothes hanger. Shelves can also look minimal if painted in the same color as the walls and can house books and photographs. When you design a bedroom which is small having that blank canvas of white paint really does help you because you add to it and as you do so, you begin to see when things look out of place. Designers these days go for minimalistic approach for a very good reason. Look at show homes and you will see that they are maximized by having furniture and accessories which make the space look larger than it actually is. The idea is to maximize space and minimize bulky and large items. Comfort can still be achieved. Instead of having a separate dresser, why not reorganize your wardrobe or closet space and add boxes for shoes, racks for clothing, and drawers which replace the need for a dresser. Remember that all rooms should have a focal point. This is really vital to design success. Hang a large mirror to full height to give the impression of space. Add a colorful rug and throw cushions in a great contrasting color to your chosen duvet or bedclothes and you automatically add that focal point. For a child’s room, it’s very easy to maximize space. Try bunk beds which incorporate a desk or homework area and a wardrobe. A child will be very enthusiastic about the addition of an item such as this and may even be able to give adults ideas about what they want to use the space for. These children’s bunk bed combinations are wonderful space saving items. Again the walls should be colored in light colors, allowing all the child’s belongings to color the room. Try white beds with brightly colors bedclothes. These make startling contrasts and again create the illusion of space. Create the modern look with black and white accessories, or go metallic. These give clean lines, thus giving the impression of organization. A small bedroom doesn’t have to look small. If you shrink the size of furniture the room automatically looks bigger. Take away bulky window dressings and add curtain rails which extend past the windows so that maximum light can enter the room. Even in a child’s bedroom, curtains in light colors help create the look of space. The guest bedroom is usually the smallest bedroom in the house, but is possibly the most important, since guests will remember that room. Having painted and prepared the room in light colors, add a wrought iron bed with a matching light fitting. The simplicity of layout helps the size. Add a splash of color with a patchwork quilt, add Artwork which highlights the color of the quilt. A suitcase rack will be useful for overnight guests and won’t take up as much room as a wardrobe. Remember, these are rooms for temporary visitors. They don’t need huge wardrobes. A small wardrobe with ample space will suffice. Add wonderfully colorful towels and keep these for guests. All of the above elements make your guests feel welcome in your home, and what better way of welcoming them than having a comfortable rug next to the bed that blends in with the colors of the quilt? All of these ideas will help you to make the most of a small bedroom space and make it look larger at the same time. This helps you as a homeowner to enjoy your home more.